Azi on the plane: Azi is 18 months old, traveling with his father. He was quite possibly the most well-behaved child I’ve ever seen on a plane, and I had the pleasure of sitting next to him from Kansas City to LaGuardia on a full flight. Azi has chocolate brown eyes and the longest eyelashes I’ve ever seen. He had a great smile, and that look of wonder in his face. I got to hold him for about 40 minutes, giving his dad a little break. He giggled when I cooed in his ear. He squirmed and laughed, squeezed my hand, played peek-a-boo and methodically shredded a couple of pages from the in-flight magazine. I just purred with delight. The flight went by entirely too fast. Taxi man at sunset: We settled into a cab, small conversation with the driver, who wasn’t entirely chatty. Until suddenly he exclaims: “It’s sunset!” He’s grinning and looking around, relieved. He explains: This is Ramadan; I have been fasting all day. Just now, it is sunset and I can now eat. We ask what he will eat, how will he celebrate. Watermelon comes first, he says. How sweet that watermelon will taste! We wish him a happy Ramadan when we leave. On the streets: I always make a point to visit Patience and Fortitude; this time was no exception. I love the library for its beauty and sturdy adherence to honor the value of books, learning, knowledge. Not just within the granite walls. On the front patio, there’s a lesson underway in fly fishing. Yes! Earnest students are practicing throwing their lines, trying to get the snap just right, watching the arc of the line before it hits the pavement. 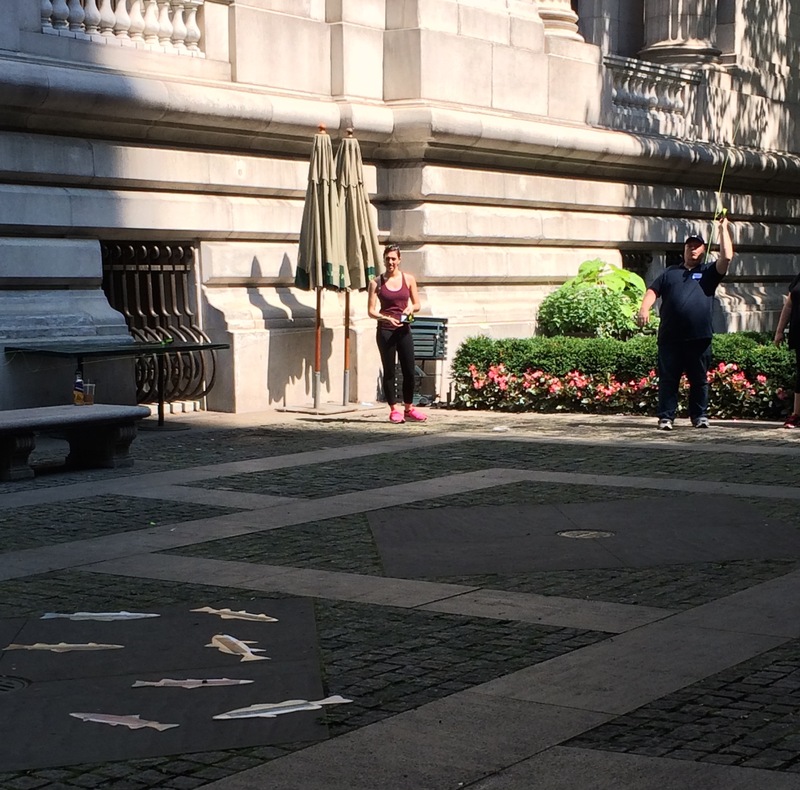 After a while, their instructors place cardboard fishes on the ground, adding to the challenge. I imagine the fish swimming in the dappled sunlight under the great plane trees. 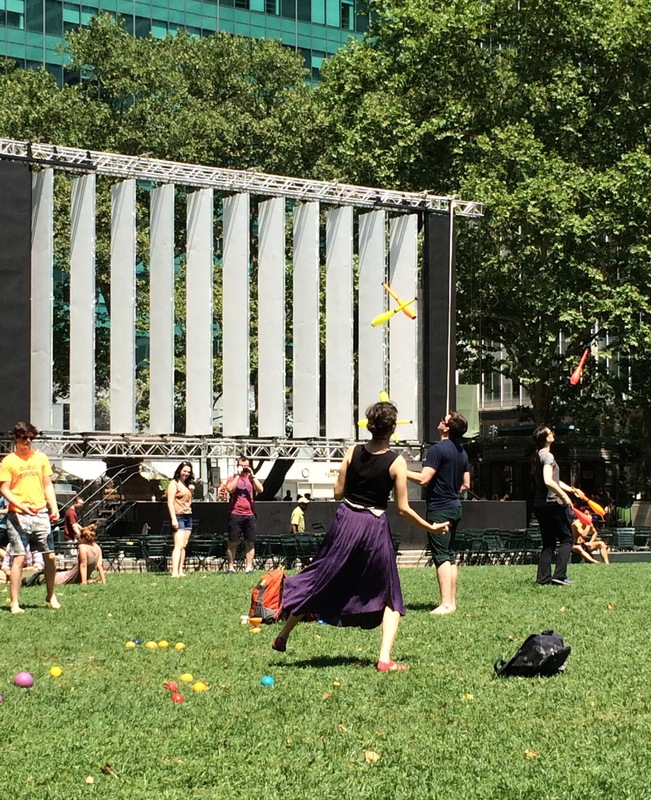 Behind the library, in Bryant Park there are juggling lessons underway, open to all. The instructors warm up, some in teams, tossing pins back and forth. The students share a look of extreme concentration while around them, the park buzzes with activity — friends having picnics, young lovers kissing (and passerbys snaking photos of them), the carousel spinning with Edith Piaf music, chess matches, runners, dog walkers, and on and on. A glorious pageant unfolding on a beautiful morning. I felt like the entire population of people that I encountered were insiders, like they were all sharing some amusement. They were friendly, none of the old stereotype of mean and impatient New Yorkers. They were quick to laugh, a trait I love and share, and as a result, I had a lot of smiles with strangers. Sure, some of it might have been spawned by corporate policy encouraged by hotels and restaurants, but it worked. These were human-to-human encounters, and while they were brief and of little matter, they were real. Like the solemn young Greek bartender named Lazarus, who told us that he is serious about his craft of service. He proved it with his attention to detail; in conversation, with his thoughtful comments. A rare smile felt like a reward. Like the doorman on the day we were leaving — he asks how was our stay, and then interrupts us, a careful look. Hey! he says, I recognize you. You were here last year! I confirm that we had been here last year, but he’s already convinced. I remember you, he says, because you guys make such a great couple. With that, we’re on our way. I admit that we wondered if it was a gimmick, but it made us feel good and it was a nice experience. It worked. New York, New York — what a wonderful town.